I have listed a new property at 112 RIDGEMONT CRES in Sherwood Park. Don't miss out on this immaculate 1720 sq.ft. 2 plus 2 bedroom walkout bungalow backing onto a private treed reserve in the prestigious neighborhood of "The Ridge". Interior features offer a spacious front entry & open concept design w/ 9' ceilings & on-site hardwood flooring thru-out the main floor; central staircase; formal dining or flex room; white kitchen cabinetry w/ breakfast island, stainless appliances & adjoining dinette area; livingroom w/ gas fireplace; bedroom w/ access to main 4pc. bath; master suite w/ wall closets, deck access & elegant 5pc. ensuite bath and main floor laundry room. The walkout basement offers 9' ceilings; family room w/ woodburning fireplace; games area; den; 3pc. bath; 2 gigantic bedrooms for the kids and a storage/ mechanical room w/ central A/C. Additional amenities include a 24'x22' attached garage w/ floor drain & H/C water; 30' wide concrete parking pad; upper deck off the kitchen & MB ; exposed aggregate concrete pad and the list goes on! SIMPLY PUT...GREAT VALUE! I have listed a new property at 83 SUMMERFIELD PT in Sherwood Park. Don't miss out on this charming 1,400sq.ft. 2 storey 3 bedroom family home in the desirable community of Summerwood. Interior features offer a spacious front entry; carpeted livingroom with gas fireplace and huge bay windows; country size kitchen w/ hardwood flooring, corner pantry, breakfast island & adjoining dinette area overlooking the back yard, and the main floor laundry & 2pc. bath at the back entry. Upstairs you'll find 2 children's bedrooms; 4pc. main bath and a generous sized master suite w/ huge bay windows, walk-in closet and a full 4pc. ensuite bath. The basement was professionally developed 4 years ago with an open concept in mind and includes a family room, recreation area, framed & roughed-in bathroom and mechanical room w/central A/C. Exterior amenities offer a fenced yard, 20'x12' deck and a 20'x20' detached garage. All this is located in a quiet cul-de-sac and within steps of the neighborhood park and area trail system. SIMPLY PUT... GREAT VALUE! I have listed a new property at 903 VILLAGE MEWS in Sherwood Park. Don't miss out on this recently renovated 1,135 sq.ft 3 bedroom 2 storey 1/2 duplex nestled in a quiet cul-de-sac in Village on the Lake. Within walking distance to Village on the Lake Sports Park & Westboro Elementary (K-6) school and New Horizons (K-9) charter school. Updates over the past few years include shingles, vinyl windows, hot water tank & hi-efficiency furnace. Renovations just completed include a brand new kitchen w/ white cabinetry, granite countertops, tiled backsplash, vinyl flooring and new dishwasher & microwave; complete bathroom reno's (2pc. & 4pc. ); lighting, electrical switches & receptacles throughout; interior doors & paint throughout; exterior storm doors; carpets, furnace & ducting professionally cleaned and the list goes on! NO CONDO FEES! Move-in ready! SIMPLY PUT... GREAT VALUE! I have sold a property at 3139 145 AVE in Edmonton. RARE FIND! Don't miss out on viewing this well maintained 1070 sq.ft. bungalow style "Original Owner" home that has been smoke & pet free since new. This perfect starter family home offers a functional kitchen; combination livingroom/ dining room with wood burning fireplace; 3 bedrooms on the main level and a full 4pc. bath. The basement has been left undeveloped and allows you to design it as you see fit. Added basement features include roughed in plumbing for a future bath; Lennox hi-efficiency furnace & air exchanger; updated 40 gallon hot water tank; reverse Osmosis water filtration & water softener systems. Exterior amenities include updated roof shingles; low maintenance exterior; detached 20'x12' wide garage w/ a 20'x12' concrete apron; fenced yard, storage shed & garden area. Situated in a quiet crescent location and within walking distance to Kirkness Elementary School make this home a must see! SIMPLY PUT...GREAT VALUE! I have listed a new property at 3139 145 AVE in Edmonton. I have listed a new property at 39 Glenwood CRES in Stony Plain. Location..Location..Location! Backing onto farmers field. Quiet crescent location. Pride of ownership is evident in this exceptionally well maintained 1205 sq.ft. 3 plus 2 bedroom family style bungalow located in The Glens of Stony Plain. Main floor features include a spacious front entry; carpeted living area; country sized raised oak kitchen with an adjoining dinette; 3 bedrooms and a 4pc. main bath. A fully developed basement offers 2 additional bedrooms; family room; 4pc. bath; laundry room and a storage / utility area. Exterior amenities include a south exposure 28'x12' tiered deck; storage shed and fenced yard. A perfect retirement home for those looking to downsize or a great starter home for a young family. SIMPLY PUT... GREAT VALUE!! I have listed a new property at 15 Greengrove DR in Sherwood Park. I have listed a new property at 9706 91 ST in Fort Saskatchewan. Don't miss out on this well maintained 1,030 sq.ft. 3 bedroom bungalow style family home complete with double garage and RV parking! Main floor features include a livingroom w/ hardwood flooring & fireplace; raised oak kitchen cabinetry w/ adjoining dinette & laminate flooring; main 4pc. bath and 3 bedrooms with parquet hardwood flooring. The basement offers a family room w/ free standing wood burning fireplace; den; partially finished 3pc. bath; ample room for a 4th bedroom; storage area and mechanical room w/ updated furnace, central A/C and newer hot water tank. Exterior upgrades include newer roof shingles and updated vinyl windows thru-out. The oversized lot accomodates a super wide driveway with enough space for an oversized 26'W x24' heated & insulated detached garage; RV parking; southwest exposure backyard w/ concrete patio, storage shed and fenced off garden area. 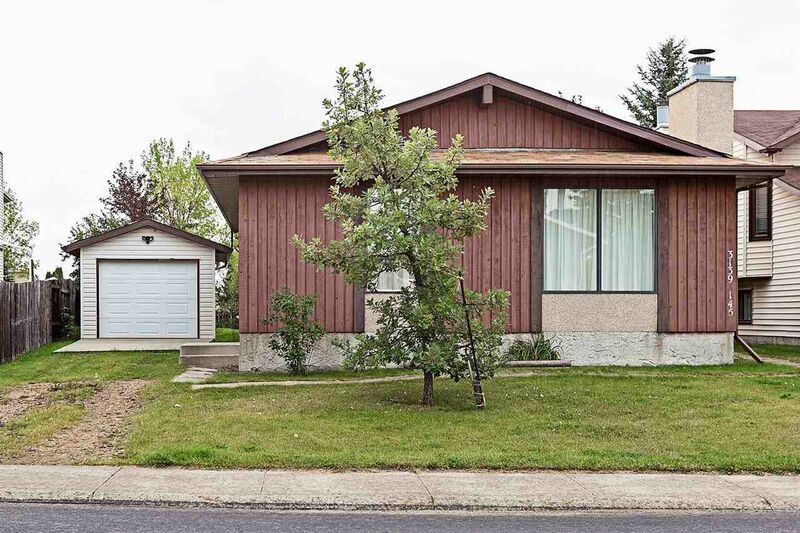 Located in a quiet crescent and conveniently located to neighborhood schools and RCMP Park. SIMPLY PUT...GREAT VALUE! I have listed a new property at 3633 112 AVE in Edmonton. Estate Sale. Attention first time buyers & investors! This home needs some lovin & sweat equity, yet boasts over 1,130 sq.ft. of main floor living area with a kitchen & familyroom addition overlooking the backyard. Currently a 1 bedroom up, but has the potential to convert the dining room back into a 2nd bedroom. The basement has a recreation room, bedroom and 3pc. bath. Exterior amenities include a private backyard with an exposed aggregate walkway & patio, newer fencing & concrete retaining wall. A mechanics dream is in the making with a 5 year old oversized 24' x26' detached garage & 20’ x30’ concrete parking pad with back alley access. Located in a quiet crescent location and within walking distance to Ivor Dent (K-9) school and park area. SIMPLY PUT... GREAT VALUE!